When my sister and I would visit our family in Kentucky in the summer as young kids, we had a bit of a ritual. My cousins, my sister and I would make the long-awaited trip to…. To the average person, that may not seem very exciting. In fact, for many people it falls into the category of “errands,” thus making such a trip dull and uninteresting. My cousins, my sister and I, however, lived for Rite Aid in the summer. Papa would give us each $10 or $20 and take us to Rite Aid, where we really knew how to stretch a buck. Oh. Ok. Well, Lauren and I thought it was exciting. We would play “passport service,” a game we invented and probably spent hundreds, if not thousands, of hours playing when we were young. To play passport service, we needed paper and index cards and pens and highlighters and hole-punchers and paper clips and lots of office-y things. And gum. We always left room in the budget for a package of bubblicious gum. That was our one splurge. Other than that, our purchases were strictly business. 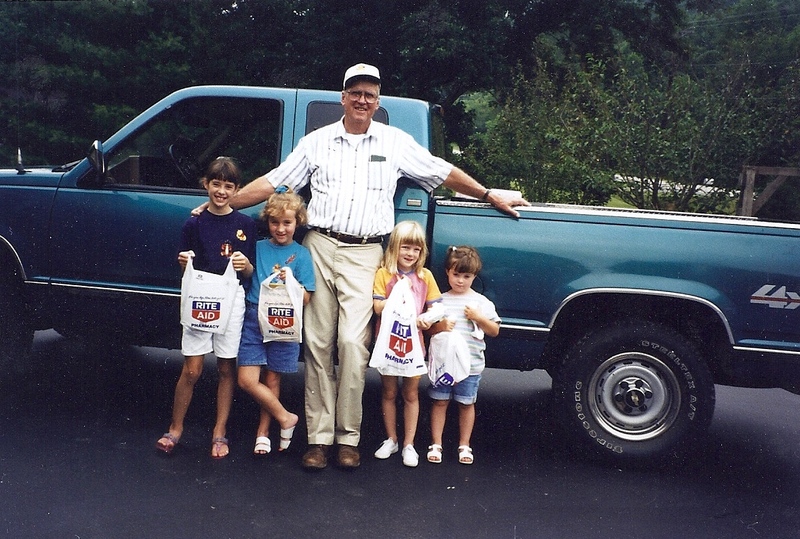 See how proudly we were displaying our Rite Aid bags? We were very serious and enthusiastic about Rite Aid. Papa was just glad to have his polecats together. Sadly, about 10 years ago, the Rite Aid went out in Burkesville. We wore black for a month. Not really, but we certainly took it hard. There is currently a cowboy store in the former Rite Aid location and I can’t bring myself to go in there because I haven’t gotten over Rite Aid closing yet. R.I.P. Burkesville Rite Aid. Thanks for all of the good times and practical purchases.